Followers of @shepherdmanswife may have been expecting this – my “Christmas selfie” taken after returning from a dog walk when I discovered that @shepherdmanswife had decorated the magnolia in our front garden. The shot was obvious, which is why @shepherdmanswife had already taken it. Nevertheless I have included my version. 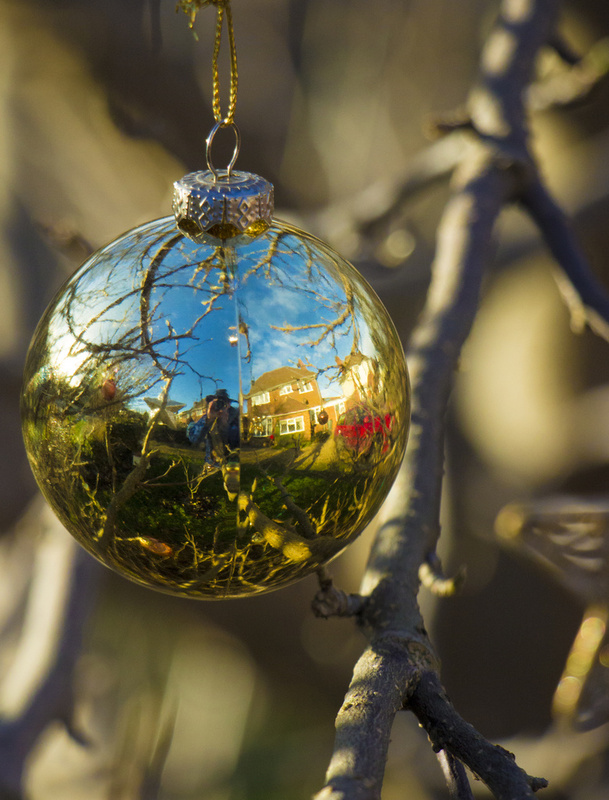 I really like the way you have caught the branches and sky in the bauble. My kind of selfie (if I ever did one) - just a tickle of an idea of what you might look like. Really like the bauble outdoors idea. Nice selfie pose and capture! really great reflections within the ball. What a great idea and lovely composition. The reflections are fab! Super shot. Perfectly done. You could use that next year as a Christmas card.